The 14.1" models consumed 60 W of power, weighed 5.9 pounds, and had the following dimensions: 12.7" W x 10.2" D x 1.35" H.
Introduced in July 2005, the iBook G4 (Mid 2005) was essentially a speed-bump of the existing iBook G4 (Late 2004) line. Airport Extreme and Bluetooth were now standard on all models, along with 512 MB of RAM, considered the minimum for smooth operation under Mac OS X 10.4 Tiger. Apple also simplified the product line, reducing the number of configurations from three to two: 12.1"/1.33 GHz/512 MB/40 GB/Combo Drive/$999, and 14.1"/1.42 GHz/512 MB/60 GB/SuperDrive/$1,299. 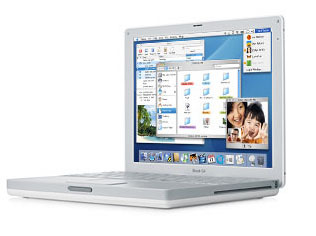 The iBook G4 (Mid 2005) was the last Apple product to use the iBook name, and was replaced in May 2006 by the MacBook.